Masters degree courses include group work and participation in competitions that develop students team-working skills. 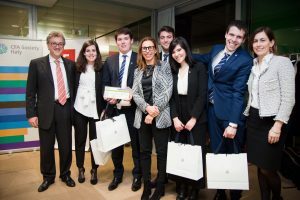 University of Pavia wins the CFA Research Challenge 2018 and goes to Dublin for EMEA finals. CFA Research Challenge is a financial competition, organised by CFA Institute and promoted in Italy by FactSet, Fidelity International e PwC. In this competitoin every year participating the best World’s University alla quale ogni anno partecipano le migliori università al mondo. “Create a Group” is an initiative that involves MIBE students to make working team that contend on problem solving. 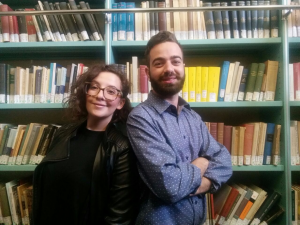 Mibers rock, again: we are glad to announce that two MIBE Students : Giuseppe Giorlando and Cecilia Cerrato, have been selected – among thousands students from all Southern Europe Universities – to take part in the final of CEO Challenge by Procter & Gamble. 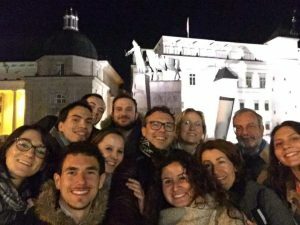 Six MIBE students – Emanuela Bello, Fabrizio Dell‘ Avvocato, Giuseppe Giorlando, Moritz Hoffmann, Vanessa Li Puma and Rossana Ragone – have just returned from the annual project week of the MARCIEE program (MARCIEE, which stands for Marketing Communication Innovativeness of European Entrepreneurs, an initiative funded by the EU). 54 students of the International Marketing & Entrepreneurship course took part in another edition of X-Culture Students Collaboration Project.They had to provide solutions to real management problems and prepare real business reports with their international colleagues. 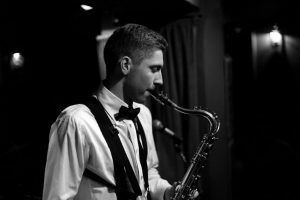 For the second year in a row, students of the University of Pavia had one of the best performances among 112 universities in 42 countries. 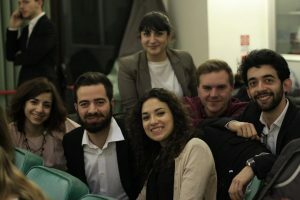 The Pavia team was composed of 7 members: Marta Armanini, Valentina Beretta, Federico De Grazia, Federico Dellanoce, Antonio Iovine, Julia Nagaikina, Natalia Zelaschi. Professor Birgit Hagen was responsible for the supervision of the team and of the work with the support of three Phd students: Marcin Bartosiak, Emilia Cubero Dudinskaya, Andrea Setti. 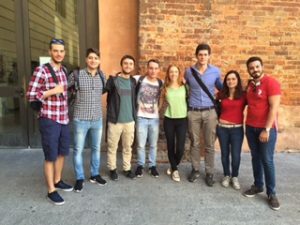 Two students from the University of Pavia, Federico De Grazia and Antonio Iovine, achieved first and second positions respectively together with their international teams. Students recognized that the project, though being hard and challenging, allowed them to be enriched by new knowledge in marketing, entrepreneurship and innovation, as well as new acquaintances.